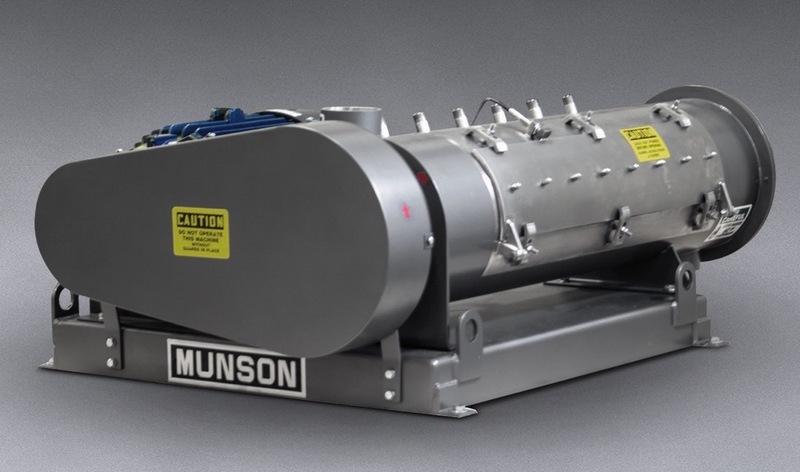 Munson’s Variable Intensity Blender with six injection ports allows liquid additions in small to large volumes to be combined with bulk food, chemical or pharmaceutical materials to produce pastes and slurries at high rates. A large-diameter solid main shaft rotating within the cylindrical vessel is supported by externally mounted bearings with air-purged seals. Large radius welds connecting paddle arms to the shaft permit rapid cleaning and sanitising. For non-sanitary applications, optional agitators with threaded paddle shafts can be individually adjusted for pitch up to 180° to impart various degrees of blending intensity. The agitator is driven by a 15 kW explosion-proof inverter-duty motor with enclosed gear reducer and variable frequency drive that can rotate the agitator at speeds from 600 down to 120 rpm with no overheating. Contact surfaces and/or the entire support structure are offered in #304 or #316 stainless steel, carbon steel or exotic materials.